Whether it is News, Sports, Documentaries, TV Programs, Concerts, we are on site to cover and broadcast your event live anywhere in Italy. 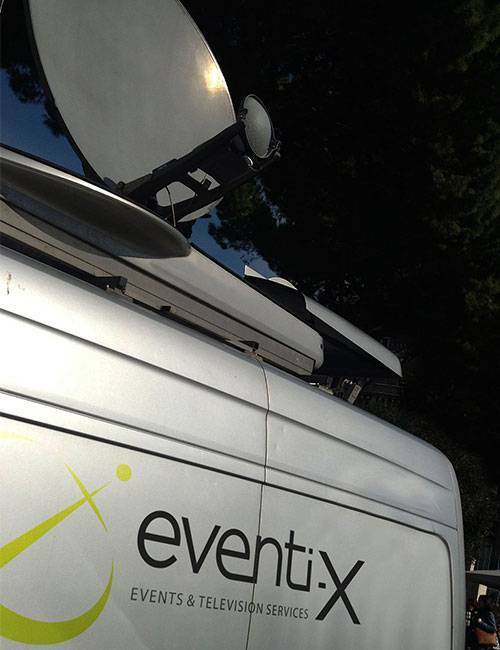 OBVAN: Our renowned knowledge and experience in Live broadcasting have given us the opportunity to work with the biggest TV networks. We provide all the broadcast facilities from individual and team sports, to concerts and international political events in South East Europe. Our OB Van and Production trucks, along with our team of professional technicians can cover your multiple camera events at the highest desirable level, delivering excellent quality of services. STUDIO FACILITIES: We can offer our clients fully equipped Live studio productions from a single camera interview to multi-camera studio productions. DSNG stands for Digital Satellite News Gathering. DSNG system is used as a mobile earth station. To perform live broadcasting from a remote place where any physical link like optical fiber, transmission wire, radio link are not available, then the satellite link is the only way to send the raw footage to the main TV station. The DSNG system is approximately similar to the earth station system together with a mini program control system.